Having experience five years of drought (and a major wildland fire just over a year ago that was so major partly due to that drought) in the not too distant past, it is understandable that everyone I meet in Sonoma County is thrilled that this winter seems to be a rainy one. December was a bit dry, but the New Year has seen a goodly amount of storms and this week we are supposed to have rain for seven days running. Since all except a tiny bit of our precipitation happens in the fall and winter, this is good news. The flip side is that it feels damp and chilly. A great time to make soup and stew and braises of all sorts, plus a good time to bake. A few days ago I baked some Maple Blondies using a new recipe I found in the Holiday 2018 issue of Sift, the King Arthur Flour publication that has so many tempting recipes. This was part of an article on maple syrup and it included lots of recipes including a Maple Oat Bread that I'll probably be baking soon. Maple syrup, the real kind, not the ersatz pancake syrup kind, is made from maple tree sap that is boiled down until it is a syrup. The sap starts flowing towards the end of winter, so I always think of maple as a winter flavor. 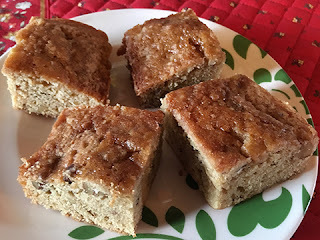 This recipe has maple syrup in the blondies themselves and in the optional glaze (which I skipped), plus maple flavoring. I don't care for the way maple flavor tastes, so I substituted pure vanilla and that worked out well. These are a firm, springy kind of blondie with a close crumb. The chopped walnuts add both flavor and crunch. The maple flavor develops over time. The blondie I ate the day I made them was OK, but the ones that were in an airtight tin which sat in a drawer for a few days were excellent and very much immersed in full maple flavor. These are easy to make. For one less bowl to wash, sift the dry ingredients together onto a large piece of waxed paper. 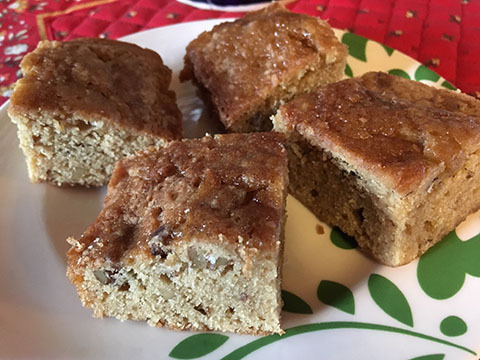 Gather up the sides of the waxed paper and you can slide the dry ingredients into the butter mixture when it is time and then re-use the paper to wrap some of the cooled blondies for lunch boxes if you like. Just be sure to read the recipe carefully. I forgot to add the maple syrup at the right time, so I had to add it to the batter later, which may have changed the texture a bit. Preheat oven to 350 degrees F. Lightly grease an 8" square pan. In a medium bowl whisk together the flour, salt and baking powder and set aside. In a medium heatproof bowl in the microwave, or a 2-quart saucepan, melt the butter and brown sugar together. Remove from the heat and stir in the syrup. Let cool to lukewarm, then stir in the eggs, one at a time. Add the vanilla (or maple if you are using maple flavoring). Stir the dry ingredients into the butter mixture until evenly combined. Stir in the nuts. Transfer the batter to the prepared pan and bake for 25 minutes, until the top is shiny and the edges just begin to pull away from the pan. Remove from the oven and let cool before cutting. Optional: Make a glaze by whisking together 1 cup (4 oz) confectioners' sugar, 2 tablespoons (1 3/8 oz) maple syrup and 1-2 tablespoons milk or cream (using enough liquid to get a pourable consistency) and drizzle over the cooled bars.